This innovative recreational experience is divided into sections. The course is 800 feet in length, built with natural boulders and divided into sections. The top is a series of drops and pools of different experience levels and has some fast eddies. The middle portion consists of flat, broad, shallow surf waves with huge random boulders – a prime workplace for gates. The bottom section entertains paddlers with more extreme surf and wave drops. The class of this course will require paddlers proficient on fast moving, cold water, particularly during high flow season. There are no fees for drop-in usage and the course is unsupervised. Parking is located at Lions Park, the ball fields and adjacent areas. Vanover Park is also available for parking and provides a take-out site for those continuing downstream after maneuvering the course. In 2002 six additional drop structures were constructed. 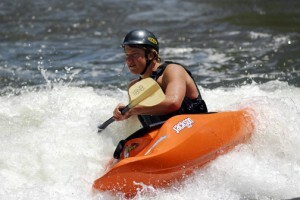 These structures provide a great recreational opportunity for white water access. They are located downstream from the competitive course behind City Hall and on either side of the Washington Avenue Bridge. With this expansion, Golden now provides 7 city blocks of White water activity on Clear Creek. 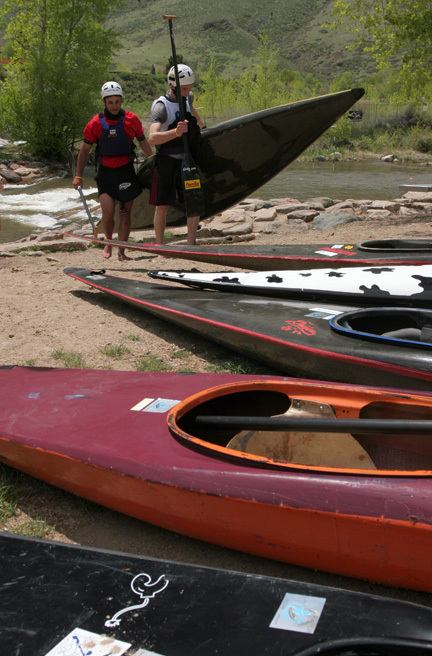 The course has hosted various events including the Colorado School of Mines Spring Icebreaker, The Clear Creek Whitewater Festival, The Open Canoe Championships, The Junior Olympic Championships, and the Eddie Bauer Invitational to name a few. There are also reported sightings of the U.S. Olympic Kayak Team practicing at the course! The City offers an abundance of free and paid parking near the Whitewater Park. Please see our Parking page for more information, including maps of the area.